Target’s Twitter account got hacked by some pretty nifty hackers. This hack was committed to dupe customers into a Bitcoin scam. 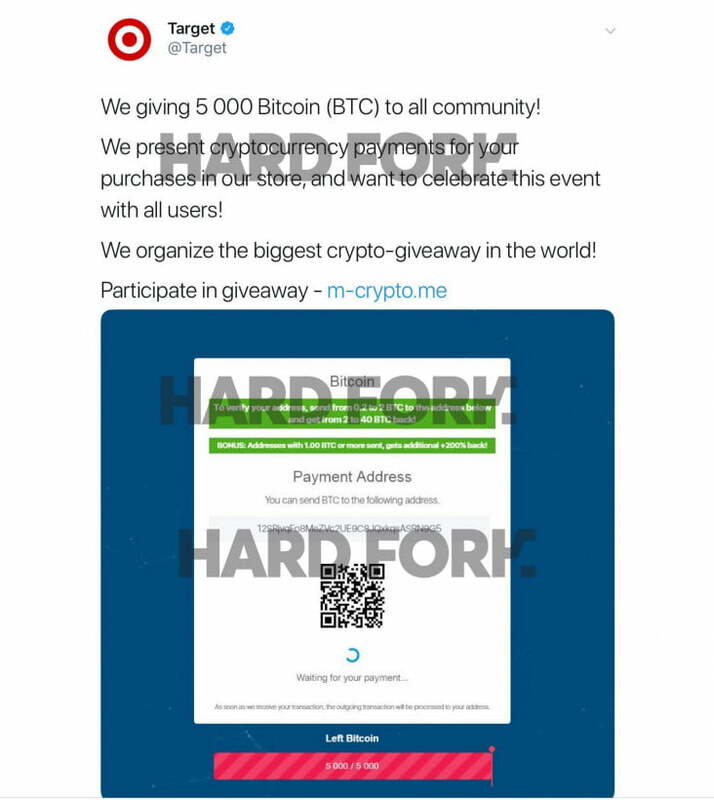 The hackers started handing out millions of fake Bitcoin promo links to Target’s nearly 2 million followers on Twitter. The tweet has been deleted since then, fortunately. The hackers were asking for some Bitcoins cryptocurrency for entering a $30 million giveaway. This amount equals to 5000 BTC. Obviously, this is a scam; whenever someone asks for money on the internet, one has to be extremely careful. Then, it added a link for the giveaway. The problem is that since the tweet was sent by Target’s official verified account, it would have been easy to fool many followers. But if one had a keen eye for such sort of shady giveaways and possible scams, this ordeal could have been avoided. Target has been silent during this whole incident and hasn’t even published an official statement. It will be quite interesting to see how the hack occurred in the first place. It also remains to be seen how many people were affected by this hack. Then again, we saw Google G Suite’s official Twitter account being hacked the next day. The problem is that since the tweet was sent by Target’s official verified account, it would have been easy to fool many followers. But if one had a keen eye for such sort of shady giveaways and possible scams, this ordeal could have been avoided. According to TNW’s investigative team, only a few transactions were made on the BitAccount link posted by the hackers. Each transaction didn’t amount to much money either way. There’s another loophole in the whole story, however. These small transactions could have been made by the team of hackers themselves. This could have been done to make the account seem more legit. It also remains to be seen if this team of hackers were responsible for similar Bitcoin scams that occurred in the past. ‘’Impersonating another individual to deceive others is a clear violation of the Twitter Rules. We’ve substantially improved how we tackle cryptocurrency scams and continue to invest in more proactive tools to detect spam and malicious activity on our platform. The company’s spokesperson also acknowledged that scammers are continuously changing their methods and the company’s enforcement teams are working on taking them down before it’s reported. As a reminder, this is just one of such scams in a long list of hacks and shady activities in the past. There was a fake Elon Musk account that was promoting Bitcoin scams. Only yesterday there were many hacks related to political figures. These included the accounts of the US and Israeli politicians, as well as the official account of the Indian Consulate in Frankfurt. This is especially dangerous since these are not ordinary figures, rather very powerful people that hold high positions in society. If these figureheads send out any misleading statements, they can have many serious repercussions. Only time will tell, what Twitter’s stance will be in this whole situation. One thing is certain, Twitter needs to address the security of their website, and needs to take strict actions as soon as possible. Update 10:53 UTC: The story was updated according to the statement by the spokesperson of Twitter and Target.